One of the things I’m determined to do this year is to target most of the training I do at my specialist areas. I feel that I now have a fairly good grasp of the business side of translation, and last year I did quite a lot on the technical side and improve the quality and speed of my work with resources like language corpora and IntelliWebSearch. But I would like to be able to show customers that I really do know what I’m talking about when I say I specialise in certain areas of translation, and courses are one way of achieving this. So I was delighted when I found that one of the translation organisations I belong to, APTIC (the Association of Professional Translators and Interpreters of Catalonia) had organised a course on wine translation entitled: “Lengua y paladar: el mundo de lenguaje alrededor del vino” (Language and palate: the world of language surrounding wine). I enjoy wine, both drinking it and learning about it. And translating it is a challenge, particularly into English, a language which has little truly native wine-related vocabulary. That made it very interesting to hear Elena Ortiz and Isabel Espuelas explaining the process of growing and caring for vines and making red, white and sparkling wines. Through an understanding of how all these things are done and what some of the awkward terms actually mean, I should be able to produce more accurate translations. 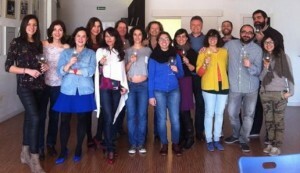 Everyone from the Aptic course on translation and wine. The two of them are from Rioja, probably Spain’s most famous wine-making region. Elena is a true expert, working in the industry and a member of the tasting panel which decides which wines from the area are good enough to be allowed to use the coveted Rioja label, while Isabel is a translator and language professional. The eight hours of the course flew by, with presentations and tastings of some of the products they brought from their home region. Highlights were a beautifully velvety Maturana red made with grapes from vines that escaped the phylloxera devastation of the late 19th century and an elegantly oaked Viura white. It was particularly useful to have an expert describing the aromas and flavours of wine without a hint of the pretentiousness that can often creep in, clarifying exactly what she meant by some of the adjectives she used. Because talking in detail about wines is a real test of anyone’s powers of desciption: is that taste peach or pear? What kind of flower is that aroma? Is that really leather and tobacco in there? There was also an introduction to what happens when wine goes wrong, with a sniffing (tasting would have been too unpleasant) of specially created faulty wines, including one that supposedly smelt like horse sweat (a problem apparently caused by a fungus). I still didn’t really get a satisfactory answer, however, to the question that always bothers me most when translating wine-related material: what are we supposed to do about grape varieties? For those of you who have never come up against them before, the difficulty is that one grape variety might have a dozen different names in different parts of the world, none of which is actually English. As a translator, you have to choose one of them. But do you use the local name or the most commonly known one in English? To take just one example, if a Spanish wine is made with Garnacha grapes do you call them that, or opt for Grenache, the French name for the same grape which is probably better known in English? As a member of a wine-making family, Elena told me that if she made a Garnacha wine in Spain she would prefer that name to a French one. But I’m not convinced that approach is always fair to the reading public. Perhaps they can guess that Garnacha is Grenache, but, following the same logic, for a wine made in Catalonia, I ought to stick to the poetic Catalan name Ull de Llebre (which literally means “hare’s eye”) instead of the much better known Tempranillo, which is the same grape in Spanish. And that choice wouldn’t be nearly as easy to justify. For the moment, my best solution to the problem is to submit to the arbitration of Wikipedia, which for some reason is excellent on grape varieties. If I key in the Spanish (or French or Catalan) name for a grape and then change the language to English, I get what should be the most commonly used name for that same grape in English. If I still feel I am being unfair to the producer by using it, I can always add the original name and a short explanation in brackets. I would love to know, however, if any other wine translators have a more elegant solution to the dilemma. For me, these courses are one of the main advantages of belonging to a translators’ association, as you can read in a previous blog here. And if you live in Catalonia and are interested in future APTIC courses, you can find out about them here (in Catalan).